The Pembroke Welsh Corgi is an exuberant breed with laidback qualities. It is a grand companion in that it is full of life and tirelessly devoted. Due to its natural herder instincts, is it also resilient as it is capable of a day of dodging kicks. In the home, the Pembroke Welsh Corgi tends to be weary of people it is not familiar with but is otherwise obedient. It has a tendency to bark and can have aggressive tendencies around other dogs. The Pembroke Welsh Corgi would best be kept physically active by participating in a daily herding session. If this is not possible, a long walk, active play time, or training session will fulfill the exercise needs of this breed. The Pembroke Welsh Corgi can survive in an outdoor environment with climates that are moderate, but it fits better in a home environment where it can be both inside the home and outside in the yard. Maintenance of the coat is reasonable with a requirement of brushing approximately one time per week to get rid of any dead hairs. The Pembroke Welsh Corgi arrived in the British Isles from Central Europe long ago. Arriving in Cardiganshire, South Wales, it was one of the earliest breeds to arrive, but its exact derivation is indefinite. It is believed that the Pembroke Welsh Corgi has roots to the English turn-spit dog, which was a short-legged, low-bodied dog that operated in the kitchens of England by turning spits for the cooks. Eventually, the Pembroke Welsh Corgi found its calling on the farm lands. Tenant farmers at the time occupied land and determined how much land that they had through the amount of land that their cattle occupied. Naturally, these tenant farmers found it beneficial to spread their livestock over as much land as possible. 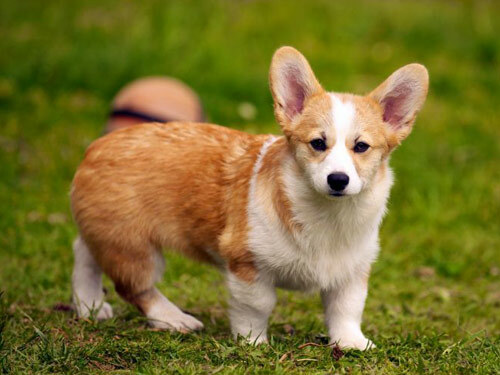 The Pembroke Welsh Corgi assisted in this venture by driving the livestock across the land by nipping at their heels to get the livestock moving. The word Corgi in the name is thought to have the meaning dogs that gather. Because of the stature of measuring approximately the length of a Welsh yard, the Pembroke Welsh Corgi earned the nickname of yard-long Dog or Ci-llathed while in Cardiganshire. Eventually the lands became formally divided and sold and the ability to drive the livestock was no longer needed, thereby decreasing the need for the Corgi. It became a luxury pet that most could not afford and practically became nonexistent. There were attempts to cross breed the Pembroke Welsh Corgi, however most were unsuccessful until the brindle herder. It was first shown as a Cardigan Corgi in 1925, but the Cardigan and Pembroke Welsh Corgi became recognized as individual breeds in 1934 and recognized by AKC in 1935. The Pembroke Welsh Corgi has remained more popular then the Cardigan in present day.